In the barn when possible otherwise sewing. Not sure if I was to post this in main or pictures. Could those that hand quilt post pictures of their quilts so I can see what it looks like and the designs available to hand quilting? 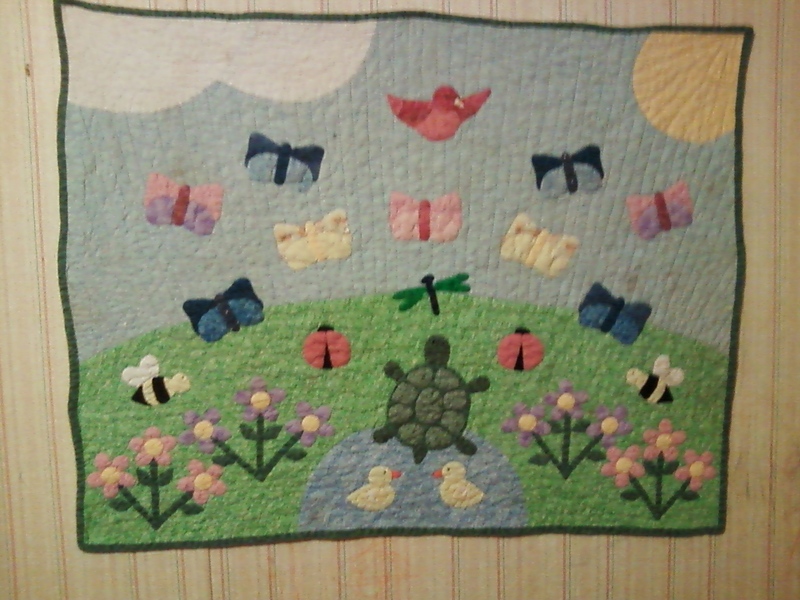 There are some pictures of hand quilted whole cloth quilts that show lovely patterns on QB. Try typing in whole cloth quilt in the search bar to see if any come up. No one would hand quilt blankets. Only hand quilt quilts. Quilts and blankets are two different things to me. I get very offended when my quilts are called blankets. Jingle -I thought I was the only one!! This is one I made for my daughter, desined by me. needle turn applique and hand quilted. My FIL used to call them rugs!! LOL! That's charming! Is this for a baby, or young child? I am afraid that I don't get offended when someone calls one of my quilts a blanket. That is what they were called when I was growing up, so maybe that is why. When we were spending the night with relatives, or vice versa, they would always ask how many blankets we might need. They always meant quilts. Blankets were just quilts. I can understand how that might bother modern quilters though. I can see what it looks like and the designs available to hand quilting? There are also many books devoted to hand quilting and hand quilting patterns. I did a quick search on Amazon, you might also check out your local library.